Ranau Lake is the widest one in South Sumatra. It is around 8x16 km2 in width with the scene of Mount Semiung on its behind. It is also surrounded by hills and valleys. Moreover, its water is so clear. The lake is a result of a natural process. It comes from an earthquake and volcanic explosion that created huge shale. A stream from the Mount Semiung later empties to this shale that turned it to a lake. There is natural hot water at the feet of Mount Semiung, which comes from the bottom of the lake. A waterfall, the Subik, can also be seen around the lake. 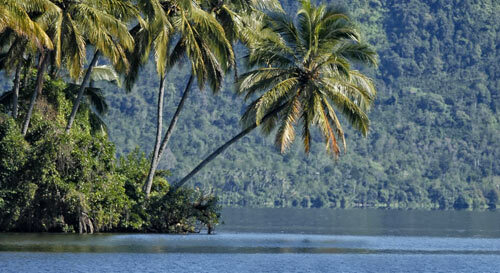 Lake Ranau locates on the border of the District of West Lampung, the Province of Lampung. The lake can be threaded with private car from Bandar Lampung through Kemuning and Liwa Hills. The road is already asphalted yet it curves all the way, at the border of the District of OKU precisely (on the southern part of South Sumatra Province and West Lampung District, Lampung Province). People can also reach the site with different routes. It is more or less 324 km from the city of Palembang, around 130 km from the city of Baturaja, and 50 km from Muara Dua. From the Sultan Mahmud Badaruddin II airport in Palembang, visitors could rent a car to Lake Ranau. If you wish to take public transportation, you could stop a bus or other type of local transportation in Baturaja Be advised that public transportation in South Sumatra usually operates only when the market downtown is open, which is every Wednesday.